Obsessive-compulsive disorder (OCD) is one of the more complex and difficult mental disorders to diagnose and treat. Treatment of this condition is complicated by the fact that OCD shares symptoms with other major neuropsychiatric disorders such as schizophrenia as well as a spectrum of related disorders such as hypochondriasis, eating disorders, and Tourette's syndrome. 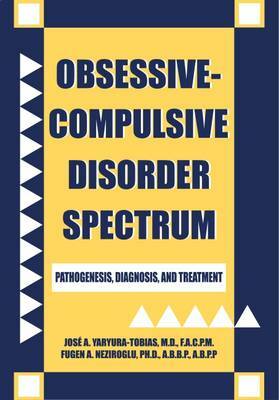 Based on extensive clinical experience with more than 2,000 patients and exhaustive literature reviews, Obsessive-Compulsive Disorder Spectrumpresents a comprehensive examination of OCD, its related disorders, and their treatment regimens. In this book, Drs. Yaryura-Tobias and Neziroglu propose a unique theory for OCD that defines the condition as a complex phenomenon of unknown duration with a variable symptomatology that affects the individual's cognitive, behavioral, biological, and social well-being. They argue that OCD is not a single clinical entity but part of a continuum of related disorders previously considered to be separate. As a result, the authors advocate an integrated approach to treatment including family intervention, cognitive-behavior therapy, and pharmacotherapy. "Drs. Yaryura-Tobias and Neriroglu have compiled an encyclopedia filled with research findings and gleanings of their clinical wisdom that will be of interest to clinicians, researchers, and individuals with or affected by obsessive-compulsive disorder and related spectrum disorders." -- "James W. Broatch, M.S.W., Executive Director, Obsessive-Compulsive Foundation, Milford, Connecticut"
"Drs. Yaryura-Tobias and Neziroglu are to be congratulated for their comprehensive review in "Obsessive Compulsive Disorders Spectrum: Pathogenesis, Diagnosis, and Treatment". Ranging from the effects of magic and religion to cognitive and behavior therapy, biochemistry and metabolic changes on the OCD spectrum, this book provides a unique insight into these fascinating symptoms and interrelated disorders which are so prevalent in our society." -- "Eric Hollander, M.D., Professor of Psychiatry, Director, Compulsive, Impulsive and Anxiety Disorders Program, Mt. Sinai School of Medicine, New York, New York"